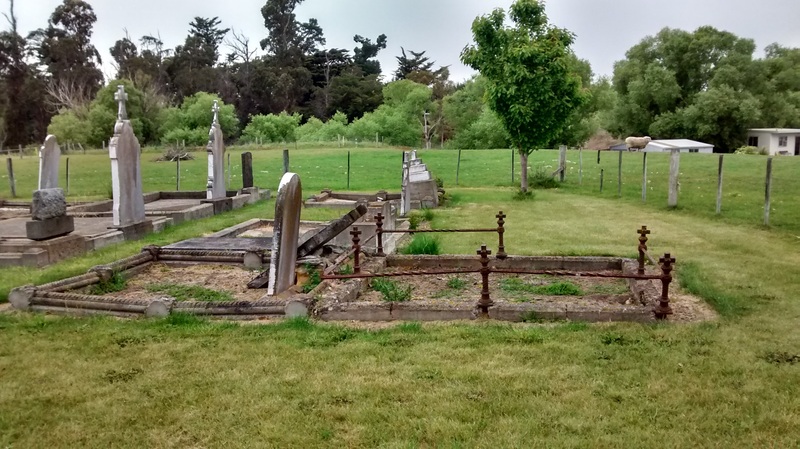 This Catholic cemetery, near Amberley, in the Hurunui District of North Canterbury, New Zealand, sits alone in the tiny rural settlement of Brackenbridge. 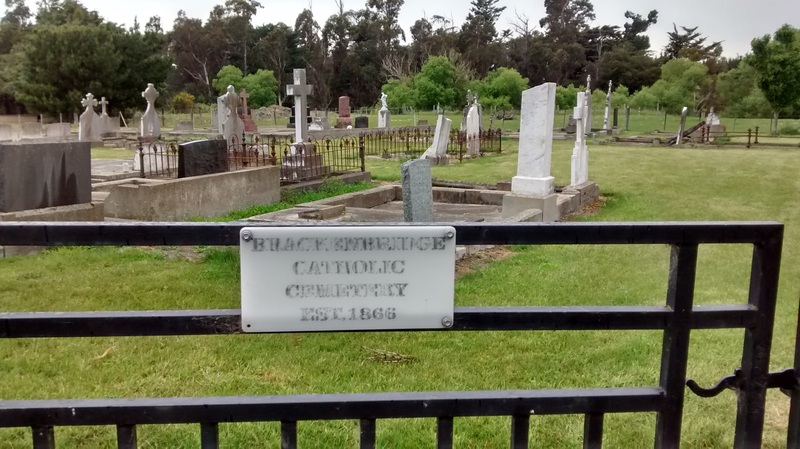 It was once overlooked by its associated Catholic Church, but this was relocated in the mid-1950s to the town of Amberley, approximately 4km to the east. The orientation of the headstones, along with old images of the church and cemetery contained in Father John O’Connor’s blog, suggest the church was once situated to the right of the image below. The Church was built by former New Zealand premier Sir Frederick Aloysius Weld (1823-1891) in 1866. It was initially intended as the Weld family’s private chapel. Two English Catholic priests served the Weld family, Father Richards and Father Price. However, Weld’s financial situation forced him to sell his 300 acre Brackenfield estate, on which the church was situated, in 1878. 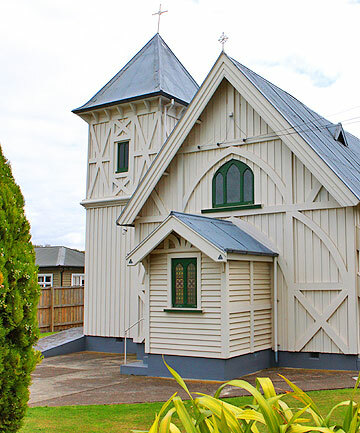 The church was among the earliest Catholic churches to be established in the Canterbury region by the ‘pioneer priest” Father Chataigner. The building cost was estimated at between £450 and £475 which came from donations from both Catholic and non-Catholic supporters, government subsidy, and Frederick Weld no doubt contributed a significant proportion. He certainly provided the stained glass windows. 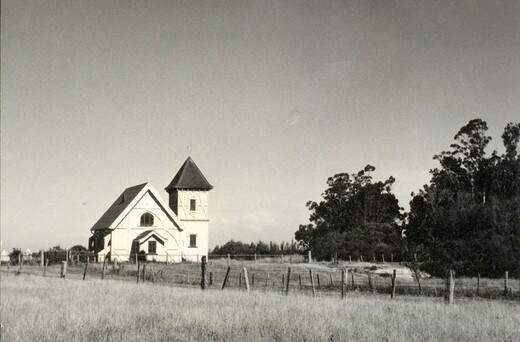 The church measured 50 feet by 25 feet, was constructed of native timber with a shingle roof (replaced in the 1930s), and its 14 pews were capable of seating 150 people. Unusually for New Zealand, the church had a rood screen. However, it was largely removed in the 1930s by Father Madden who is rumoured to have referred to it as “cow bales obstructing the view of the altar”. Brackenbridge settlement itself never took off and remains today a small collection of homes. Its growth had been gambled on the passing nearby of the railway line, but instead the rail route was constructed much further east towards the coast. The church in its new location in nearby Amberley. Note the bell-tower was moved to the opposite side of the church and the body enlarged. The cemetery contains just 55 headstones. Without an original plot/cemetery map, however, it is impossible to say whether this represents the total number of burials as some headstones may have been lost over time. High-resolution photographs of all gravestones listed (except unmarked) are available, plus one or two of the cemetery if applicable. This includes a full transcription, particularly for those stones that are hard to read or eroded. BUTLER, Amy (d. 9th January, 1901). Age 13. Daughter of R & E Butler. FITZPATRICK, Agnes Teresa (d. 24th September, 1909). Age 27. FITZPATRICK, Charles (d. 16th April, 1918). Age 69. Also his wife Ann (d. 26th June, 1925 – age 79). FITZPATRICK, C E (d. 26th February, 1958). Age 76. Canterbury Regiment. FITZPATRICK, John (d. October 1874). Age 73. Native of County Tyrone, Ireland. Erected by his brother John. Also of his niece Rosey (d. October 1873 – age 22) and of his nephew John (d. August 1874 – age 25). FITZPATRICK, Sarah (d. 24th March, 1880). Age 59. Native of County Tyrone, Ireland. Also her brother Thomas. FITZPATRICK, Thomas Peter (d. 1955). Age 71. GARTY, Annie Ellen (1876 – 1963). Nee Fitzpatrick. JAMIESON, Niall Joan. Age 11 months. LUNDY, Hannah (d. xxxxx). Age 81. Wife of William. LUNDY, John (d. 1st April, 1884). Age 15. Son of William and Hannah. McNAMARA, Catherine (d. 29th August, 1894). Age 75. Wife of Bernard. McNAMARA, David (d. 8th May, 1922). Age 71. Husband of Ellen. McNAMARA, Louisa (d. 21st September, 1910). Age 36. Also her husband, Bernard (23rd May 1949 – age 79). MORRISON, Mary Ann (d. 12th May, 1904). Age 69. Wife of Patrick. MORRISON, Patrick (d. 20th February, 1908). Age 76. MORRISON, Rose Ann (d. 8th March, 1891). Age 22. Daughter of Patrick and Mary Ann. NOONE, Joseph (d. 9th August 1909). Age 72. O’BRIEN, Dennis (d. July 1904). Age 65. Also his wife Margaret (d. 16th July 1930 – age 79) and his son William (d. 1920 – age 48). O’BRIEN, Ernest (d. 3rd December, 1936). O’BRIEN, John (d. 30th October, 1939). O’CARROLL, Annie Agnes (d. 22nd March, 1929). Age 32. Also her husband Michael John (d. 26th April, 1935 – age 45). 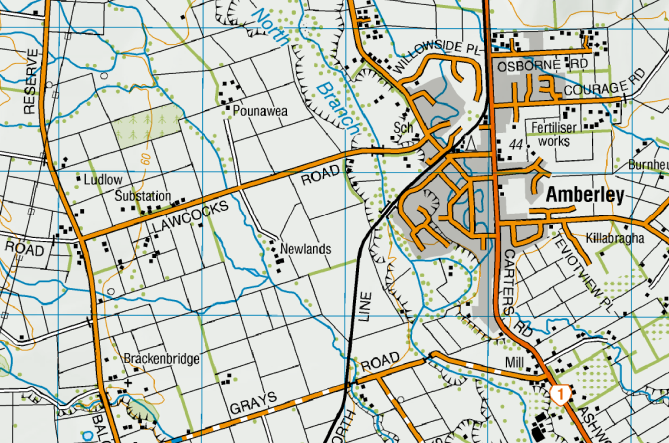 Michael John is the son of John and N O’Carroll of “Woodgrove”. O’CARROLL, John (d. 18th May, 1939). Also his wife Norah Mary (d. 19th January, 1946) and their eldest son John Patrick (d. 19th February, 1907 – age 21). O’CONNOR, John (d. 14th June, 1910). Husband of Catherine. Also his son Michael (d. 4th March, 1881 – age 6). Also his wife Catherine (d. 1917 – age 72). O’MALLEY, Francis Joseph (d. 1950). Husband of Mary Ann. TATE, James (d. 17th March, 1911). Age 77. Also his wife Mary (d. 14th March, 1918 – age 79). TOBIN, Ann (d. 22nd June, 1874). Age 55. TOBIN, Edward (d. 23rd April, 1909). Age 77. Also his wife Julia (d. 12th December, 1927 – age 88). Also their daughter Sarah Josephine (married name McGuirk) (d. 31st May 1954 – age 91). TOOHEY, Matthew (d. 2nd September, 1903). Age 77. Also his brother John (d. 26th September, 1902 – age 70) and Mary Toohey (d. 27 October, 1917 – age 73). TOOHEY, Matthew (d. 9th August, 1925). Age 45. Husband of Mary. Benjamin Topp (d. 22nd September, 1921). Age 17. Son of Mary and (the late) Joseph Topp. Joseph Topp (d. 21st August, 1915). Age 50. Husband of Mary. Mary Topp nee Cook (d. 4th August, 1927). Age 67. Wife of Joseph. Mary Cook (d. 21st July, 1913). Age 77. Mother of Mary Topp. WATSON, Arthur John (d. 1st October, 1927). Age 49. Also his wife Ada (d. 26th October, 1948 – age 67). WATSON, Bertie (d. 2nd July, 1916). Age 11. Son of J H & J A Watson. WATSON, James Edwin (1863 – 1936). WATSON, John (d. November 1884). Age 48. Also his wife Bridget Ann (d. March 1921 – age 82). WATSON, John J (d. 19th June, 1931). Age 89. Husband of Sarah M.
WILSON, Michael Dunlop (d. July 1930). Age 83. Also his wife Margaret (d. 30th October 1937 – age 88). Sarah Josephine McGuirk is the daughter of Julia Tobin who was previously mcguirk nee kavanagh. Sarah was a spinster. Ann Tobin’s headstone , I have info from another site which says that the headstone gives her age as 33. I think she is the first wife of Edward. I was baptised by Father Madden in that church when it was situated at Brackenbridge. I do have a very early memory of going to mass there as a very young child with my mother and grandparents. We drove from Amberley in an old dodge car.